Ancient skywatchers viewed comet appearances as heavenly warnings, says Austin, Texas, astrologer Donna Woodwell. Comet Pan-STARRS may herald a changing of the guard. Famous Bayeux tapestry dramatizes the disturbing appearance of Halley's comet in 1066. We feel a moment of apprehension whenever we hear the words: 'We interrupt this regularly scheduled program to bring you this important message,' Our ancestors must have felt something similar when a comet appeared overhead. To our ancestors, a comet was not usually a good sign. "We feel a moment of apprehension whenever we hear the words: 'We interrupt this regularly scheduled program to bring you this important message,'" says Donna Woodwell, a professional astrologer and an instructor at Kepler College. "Our ancestors must have felt something similar when a comet appeared overhead." "Consider the way the ancients viewed the skies," Woodwell explains. "The heavens were the realm of the unchanging divine. Any unexpected change, like a comet, would have seemed like a message from God." The meaning of a comet's message would have been found in the color, shape and placement of the comet in the sky. Comet Pan-STARRS, which will likely be visible in the northern hemisphere March 12 or 13, would have been considered a powerful omen. "Comet Pan-STARRS closest approach to the sun falls very near to what astrologers call the 'World Axis.' To the ancients, this could certainly signify major shifts in world leadership," Woodwell says. "The comet is also moving from the southern hemisphere to the northern, suggesting that it is news from southern latitudes that will have the most impact on the world stage." As divine messengers, comets could herald any kind of news, such as the birth of a great leader. However, they were most often thought of as ill omens portending the deaths of kings or natural disasters. For example, in 1066 an appearance of Halley's comet just after the coronation of the English King Harold was a worrisome sign. In fact, later that same year Harold was killed in the Battle of Hastings by William, Duke of Normandy, beginning the era of Norman rule in England. 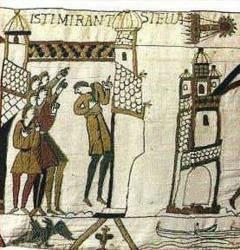 The comet sighting made such an impression that it was even chronicled a decade later in the famous Bayeux Tapestry. "It's interesting to see that coincidentally with the appearance of the comet Pan-STARRS, we have the death of Hugo Chávez, a prominent Latin American leader, as well as a conclave in Rome to choose a new Pope," explains Woodwell. "In both cases, the realities of life in the southern hemisphere may indeed prove to shape events on the global level." Comet Pan-STARRS -- named after the telescope in Hawaii that discovered it in 2011 – makes its closest approach to the Sun on March 10, and will likely be visible in the northern hemisphere a few days later. The comet is expected to be visible to the naked eye in the western sky low on the horizon just after sunset, near the crescent moon. Astronomers forecast the comet will remain visible throughout the rest of the March and early April. Comet Pan-STARRS is the first of two comets predicted to be visible in the northern hemisphere in 2013. The second comet, Comet ISON, may put on an even more spectacular show. Early forecasts suggest it may even outshine the moon and be visible in daylight hours. "Both comets are too far away from the Earth to cause a physical threat to our planet," Woodwell reassures. "But we certainly do live in changing times." "Besides, the end of the world is so last year," she added. Donna Woodwell, MA, owner of Four Moons Astrology, is based in Austin, Texas. She serves on the board of the International Society for Astrological Research and as an instructor at Kepler College. Her blog La Vita Luna: Living Gracefully in a Changing World is featured on Astrology.com.